I've written a couple of times before about New Cool Collective and their swinging music. This time I could check them out in a theater. Like I mentioned before it's weird to watch a band play while everyone's sitting down. But this time Dutch writer Jules Deelder joined them on stage. And this combination works really well. Deelder is a big jazz fan and regularly playing records in jazz clubs. He's also an amateur drum player so a snare drum was available on stage as well for him to join in on the fun. Of course he's no match for the great musicians of the band but that wasn't the idea. 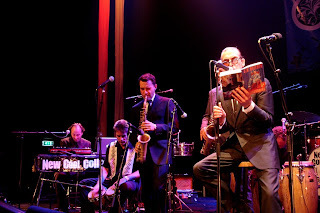 The band played many songs of their latest album and Deelder read some stories and poems. Of course he did this in his typical manner which is in a smart suit (like the band), funky sun glasses and Rotterdam accent. The Rohypnol cough sirop story is just hilarious! All band members get to play their solos as expected and especially Anton Goudsmit treated us with some fireworks. So again it was a great night. But next time I would like to see them back in a club where I can enjoy them in front of the stage, zipping beers and shaking my booty! Super Furry Animals Light Years Ahead? Cover songs: make or break? Nine Inch Nails releases album with Timbaland?